Toiling Angla in 3-digit sunscreen vs.
Ha, I think for me right now it is too hot for gardening. It is supposed to cool down this weekend. After being out this morning, I am def ready for a cold shower! That is one cracking word you’ve used: splattergasm. 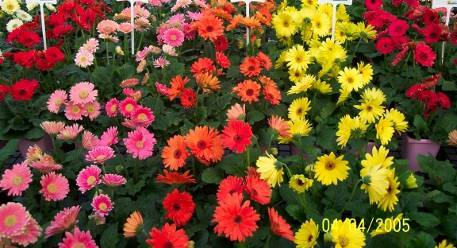 Quite worthy of those colourful gerberas. I just came in from working in my flower bed, and I’m nodding all the way through this! Now, if I can just work “splattergasm” into conversation, I will consider this to have been a good day. Oh, what a great last line! In fact I loved the whole poem. ‘Splattergasm’ is not only a wonderful word, it is so right that it almost seems obvious, and I want to put it in the dictionary straight away. Ah, I was laid up in hospital Tuesday for what was suppose to be Outpatient. Home and making my rounds. I just don’t do drugs well. Go figure. Anyhoo. Glad to sit in your garden. Brave you, gardening in the “ungodly hot air soup”. Am sure the results will be spectacular. Gardening is such therapy for me…although my thumbs are more brown than green. There is something about stepping back and looking at your work and making your spot on earth a little more beautiful. It’s a classic offering flowers and all. They’re fantastic looking flowers. It would be fun to sustain all the grand colors in the garden. Nicely Amelita!